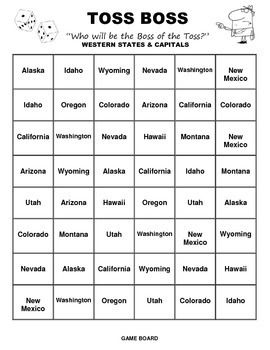 A fun and exciting game used to help learn the Western States and Capitals. 1. Players roll the dice to determine who goes first. 2. Player 1 rolls the dice and creates 2 two-digit numbers using the dice. For example: If the Player rolled 2 and 5, that roll would be the numbers 25 and 52. 3. 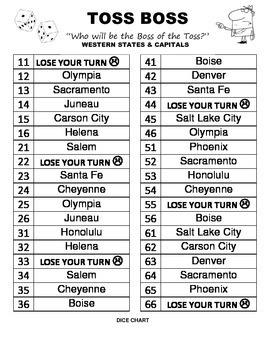 Player 1 locates both numbers on the TOSS BOSS Dice Chart. Player 1 decides which number they prefer to choose. 4. 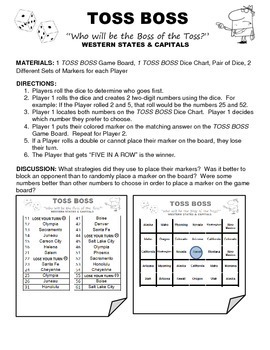 Player 1 puts their colored marker on the matching answer on the TOSS BOSS Game Board. Repeat for Player 2. 5. If a Player rolls a double or cannot place their marker on the board, they lose their turn. 6. The Player that gets “FIVE IN A ROW” is the winner.